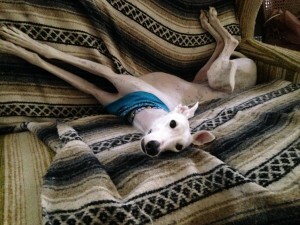 Pike-the-Galgo totally agrees that SHUG has a good track record of making good matches! Every rescue group has its own vision of the perfect adopter. Here at SHUG we try to take a flexible approach and, instead, strive to match the right dog to the right situation. We have a thorough application and approval process, which has a good track record for making great matches. Still, there are a few times we’ll say “no” pretty much right out of the gate. So here are a few of the “yes” and “no” policies for us. You can live anywhere in the U.S. and Canada. You can have cats, chickens, parrots, peacocks, horses . . .
You can have an unfenced yard (or no yard) – if you are committed to always leash-walking your dog. You can be a first-time dog owner. You can be a first-time Sighthound owner. You can be currently dog-less. You can work away from home. Your dogs haven't seen a vet in well over a year (and you aren't following your vet's recommendations). You or someone in your household has been convicted of animal abuse. You have a history of repeatedly surrendering animals. You have or plan to use an invisible fence. You won't keep your SHUG dog leashed whenever out of a fully enclosed area. Your personal references don’t think you’re an appropriate adopter. That’s it. Generally speaking, a lot of yesses, only a few nos. Keep in mind that not every approved adopter is right for every dog. We do have dogs that need a cat-free (or kid-free, stair-free, etc.) environment. We do often have dogs that don't do well as "only" dogs and we may rarely have dogs that would prefer to be "only" dogs. Once you're an approved adopter, we can work on finding your love connection. Ready to apply? Visit our online application. Still have questions? Send an email to info@sighthoundunderground.com . We’re happy to chat.